I ordered BYU Studies 45.2 (2006) for my personal library on the Gospel of Judas and the Tchacos Codex. Thanks again to Grant for mentioning this to me. It came in the mail yesterday. 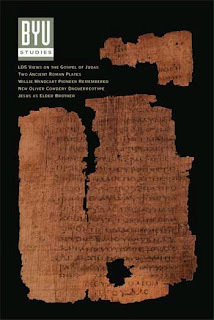 It contains six articles presented at a Latter Day Saints Colloquium on the Gospel of Judas that took place on April 15, 2006. S. Kent Brown's article "The Manuscript of the Gospel of Judas" was particularly interesting to me because he shared his own experience viewing the Tchacos manuscripts while it was on the market. He provides a witness independent of Stephen Emmel that the Tchacos Codex was found with three other manuscripts. I later traveled to New York City where, in the company of Mr. Bernard Rosenthal, a rare-books dealer from San Francisco, I examined briefly some other texts in a hotel room. The papyrus manuscripts, which included a few damaged leaves from a very early Greek copy of the book of Exodus, two letters of the Apostle Paul in Coptic translation, and a Greek mathematical treatise, were then in very bad shape, having been wrapped in an Arabic newspaper and placed in a small box. When the owner and his agent opened first the box and then the newspaper, Mr. Rosenthal and I gazed upon a mass of documents that were disintegrating before our eyes, with tiny fragments lining the bottom of the newspaper cradle (pp. 19-20). The big question for me - why were these four books buried together in a fourth- or fifth-century family tomb? This volume of articles contains some photographs that I have not seen before, taken by Kenneth Garrett and published with permission by National Geographic. A few oft-quoted NT scholars with radical views claim that it overturns the record of Jesus as we know it from the traditional Bible. But for the LD Saints, the Gospel of Judas fails as a "Gospel" because it fails to recognize the Atonement of Jesus Christ as the way to salvation. Early Christian scholars rejected it as apostate in AD 150-200, and LD Saint scholars agree (p. 6). For LD Saints, a study of Gnosticism can be a valuable pursuit. For example, it is an important resource for understanding the complexity of the growth and development of the early Christian Church. In addition, it is possible that a text from the Nag Hammadi Library, the Gospel of Thomas, could contain some authentic sayings of Jesus that are not recorded in the canonical Gospels, although it would be difficult to identify them with any sense of certainty. For LD Saints in particular, a study of Gnostic groups shows that they accepted some teachings that have certain parallels with LDS doctrines: a belief that we have a premortal existence as spirits, that a number of levels of salvation are possible, that the restoration of lost knowledge is essential for salvation, and that a type of marriage, associated with the Holy of Holies in the temple, is required to return to the highest level of salvation. These types of teachings are not prominent in modern traditional Christian theology. Thus the Gnostic texts indicate that, in antiquity, these were important issues for some Christians. LD Saints, however, must be cautious. They must guard against any endeavor to study Gnostic writings with the purpose of identifying proof-texts for their own doctrine" (pp. 32-33). So there is a certain uneasiness about the Gospel of Judas found throughout these six articles, and an attempt by the LDS scholars to emphasize that this newly discovered text is not "orthodox" for their tradition, to send out cautions to their readers not to identify with it, and to distance themselves from it.